Because the Paranormal investigation field is mostly based on theory and hypothesis, there aren’t any official pieces of equipment that can definitively detect or conclude whether a ghost is in the room, or even exists at all. The main reason being that science still hasn’t determined what a ghost actually is. Paranormal research requires an open mind as well as a practical one. Firstly we start with theories about the paranormal. Then we set out utilizing tools and equipment that are already commercially available in the attempt to confirm or dismiss these theories. One theory about spirits, is that they are made of, or draw on, energy to help them manifest. This could be electrical, magnetic, thermal or any other form of energy. Using an EMF (Electro-Magnetic Field) meter , like the Trifield 100XE EMF Meter can help determine whether there are any unusual fields of energy in the area. These devices detect fluctuations in magnetic, electric and radio/microwave energy levels. 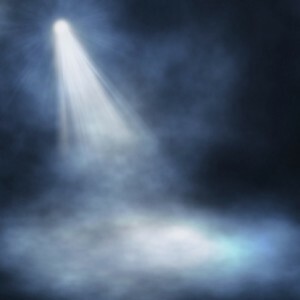 Some investigators have speculated that anomalous readings in those energy fields are a sign of a ghost. Whether this is true and fact is still open. 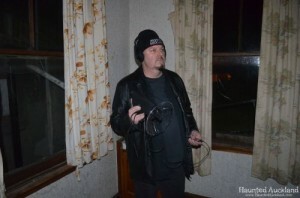 Audio recorders, video cameras, photo cameras, thermometers and various audio / visual, motion and atmospheric data gathering tools can be used as paranormal investigation equipment to gradually piece together some sort of picture. Of course, having lots of equipment does not make you a better investigator, but it does offer you more options and directions in experimentation and trialling. 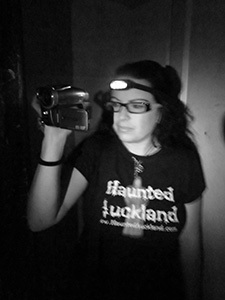 Various pieces of equipment Haunted Auckland use during our investigations to record and document possible paranormal activity. For images of the team in action, check out our investigation reports. Video is great to have, either to carry with you or to set up on a tripod and let it run in hopes of catching something anomalous. Make sure the video camera is equipped with some kind of night vision (such as an Infrared Night Vision and Full Spectrum Camcorder ) so it can record images in minimal light. The choices with video these days is amazing. Again, get the best one you can afford. High-definition video has become quite affordable, and it’s advantageous to get a camera that has either an internal hard drive or that records on memory cards. These allow you to easily transfer your video to a computer for editing and analysis. The team utilises various types of video camera equipment within our investigations. From Standard Handycams to Nightshot, Go-Pros, Full spectrum, Bloggie 3D, Digital hard drive, digital and ‘analog’ cassettes, assorted motion sensing IR mini cams, as well as a 4 IR camera DVR system. Specialist lenses and filters can be used to reduce or remove certain wavelengths of light, enabling views into the Infrared and Ultraviolet spectrum which may uncover manifestations outside the normal field of human vision. EMF Meters measure fluctuations in electromagnetic fields. These fields are a direct result of electrical appliances in home, cell phones, power lines outside and even fluctuations in solar activity and weather. Beyond that, a primary theory in the paranormal world is that entities can manipulate these fields in their attempt to manifest themselves or interact with our world. The units of measurement registered on an EMF meter is called milligauss. Theories in the paranormal field suggest that ghosts have the ability to manipulate these fields. An EMF meter is a staple piece of equipment used to detect sources of these fields or possible manipulation in order to document and promote potential communication with these entities. Take base readings throughout the area you are investigating and make note of the numbers. This will help in detecting legitimate spikes and anomalies. We use various models of EMF meters so comparisons can be made. From basic models, to Cell Sensors through to Tri Field meters. The Trap Camera or game camera is a fairly new method of capturing possible Entity’s. 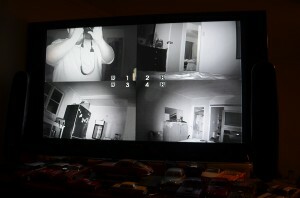 The game camera is usually set up in area High with Paranormal sightings of apparitions. The camera shoots out an infrared beam naked to the human eye with a sensor that if triggered takes a series of pictures or video clip. The team introduced Three GoPro cameras into our equipment set up to improve the viewer experience in our film productions, add an increased use of technology to capture evidence of paranormal activity as it happens. These mountable POV (Point of View) camcorders make video recording completely hands free. They can be mounted anywhere with various GoPro mounting systems from head straps, chest mounts and bike mounts to general mounts and removable adhesive mounts you can put anywhere you like. They can be worn as mobile video recording units, or postioned as static cams. 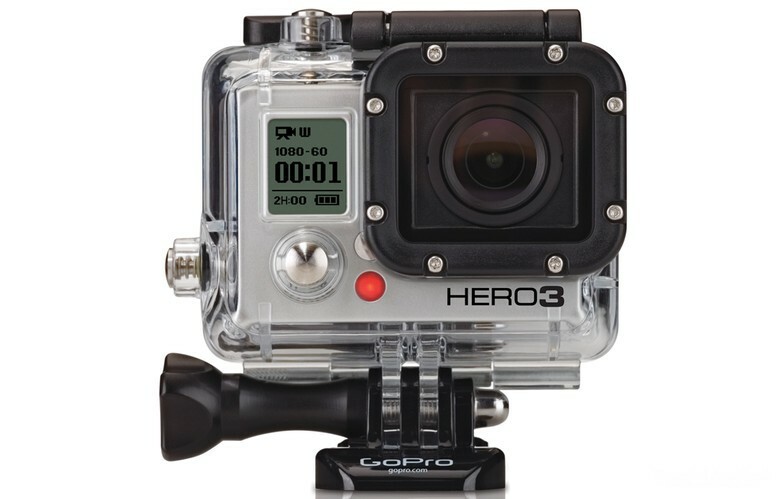 GoPro HERO3 cameras are the world’s most advanced line of on-board, full HD 1080p cameras designed to be used during sports. 1080p – “True HD” video at 30 frames per second produces amazing clarity, stability, and slow-motion capabilities. To put it in perspective, 1080p video at 30 frames per second is the equivalent of shooting thirty 2-megapixel photos per second, making them a perfect addition in the advancement of paranormal research. A good Digital Voice Recorder is needed to record electronic voice phenomena (EVP). Digital recorders are preferred over cassette recorders by most investigators because they have no moving parts; you don’t want motor noise in your recordings. Digital recorders from such manufacturers as Olympus, SONY, and RCA range in price from about $30 into the hundreds of dollars. Again, get the best one you can afford because the higher the price, the better the quality. You’ll want a model that can record high-quality sound. Some of the more expensive models record in uncompressed modes, which gives you the best fidelity. With less expensive recorders, you might also want to add an external omnidirectional microphone. The team utilises a few different models and sizes of Audio recorder. From classic analog dictaphones, mini USB recorders, to digital audio recorders, through to more high – end Zoom branded products. As there is a good chance an investigator may be working in the dark, or in low lighting, it is a good idea to stock up on torches of varying types. The light spectrum is a wide one and there are many different light sources available on the market giving you the freedom to experiment and try new things within your team whilst on location. Because the paranormal is still an unknown science, we are still all working in the theorist experimental stages. Try different techniques, theories and hypotheses to see what works and what doesn’t. No one knows for sure what the best environment to interact or witness a ghost is, so as investigators we need to try all ideas and work on every theory available to ascertain the best directions to take in the research journey. The ParaPod 2 detects E-Fields within it’s detection range. It is controlled by a small microprocessor which is programmed to be very sensitive to E-Fields or static charge, it also has the advantage of very low power drain when powered on so you dont have to worry about battery drain. It has an detection radius of 2 meters from the unit. The ParaPod 2 can also be used as an alert system for trigger objects without the use of steel plates and alligator clips. Produced by Australian based W.D Paraproduct. INFRARED TORCH – An Infrared Flashlight is a device designed to emit light that falls outside the normal visible spectrum. 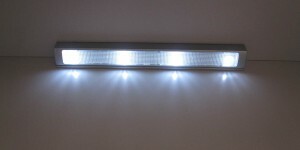 This can be accomplished through the use of special bulbs or light emitting diodes (LEDs) that only cast infrared light, though it is also possible to fit a normal flashlight with a filter. Active night vision, which requires some type of infrared light source, is the main purpose these devices are used for. When an IR flashlight is used in conjunction with a special camcorder, or other type of night vision device (NVD), it is possible to see even in complete darkness. 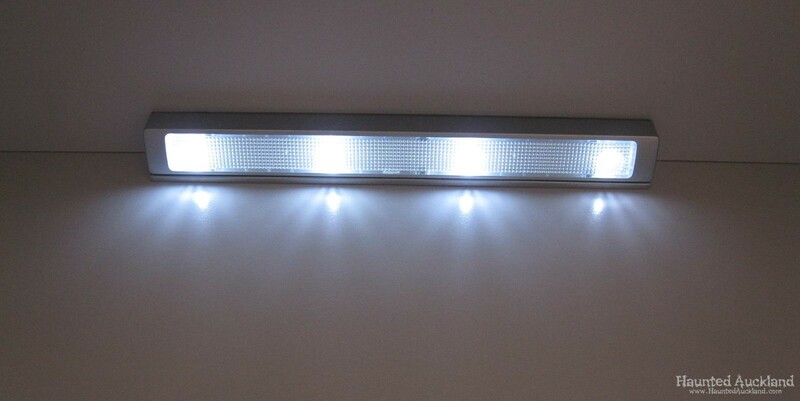 LEDs are a smart choice because you don’t have to worry about replacing bulbs; the LEDs last a long time. And don’t forget to bring along extra, fresh alkaline batteries. GREEN LIGHT TORCH- Used mainly by hunters at night and emits a bright green beam which, to an animal is not very visual as it falls under their night visibility spectrum allowing the hunter to observe the animal in the dark without being noticed. Also, the human eye recognizes the colour green faster than other colours, green light is best used for map reading or signalling, especially in low light conditions. U.V TORCH – U.V light can help in making airborne dust particles visible in the dark. 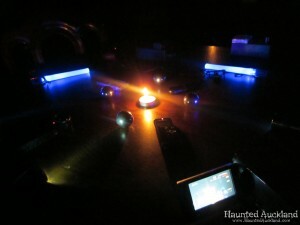 One paranormal based theory is that one can use UV light to “push” or “herd” spirits to/from a location to aid research photography, EVP, and contact. Ultraviolet light also reveals the security strips in monetary currency, watermarks hidden in bank notes and fluorescent ink and dyes used as anti-counterfeiting, check hand stamps at clubs, discover pet or other stains not visible tp the eye in carpet or upholstery, and scan a crime scene for foreign materials and body fluids. Handy when checking a hotel room for cleanliness! Very bright and can illuminate a wide area. These devices are good for sensing movement when there should be none. One sensor can easily monitor an entire hallway or room. Motion sensors are actually detecting heat signatures. When something enters its field of coverage that is above the ambient temperature (in this case, it is assuming that the ghost gives off heat, like a person), the sensor will sound an alarm. Some models are equipped with cameras and will snap a picture. These sensors are calibrated so that the object must be somewhat sizable to set it off — a mouse or a bug passing by won’t trigger it. We use a mix of sound, light and motion sensor video versions. 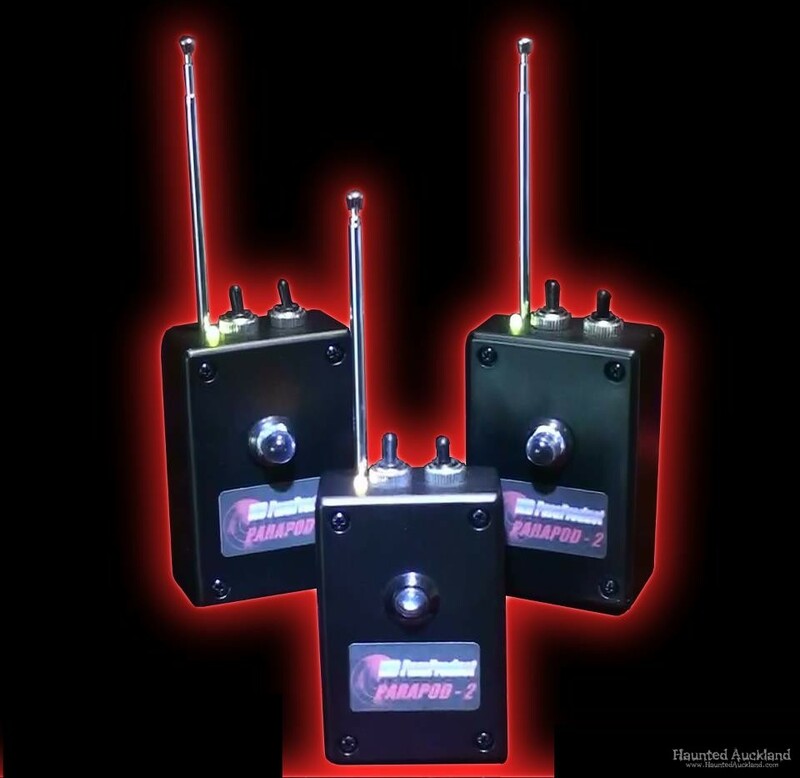 Vibration Sensor LED Lights are very handy within paranormal investigations and feature special motion sensor technology with a micro-vibration processing chip which automatically switches the light on when being triggered by the smallest of movement. 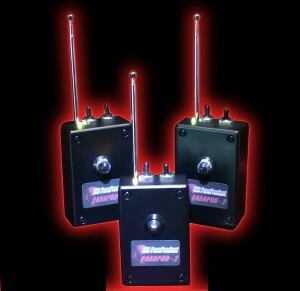 We are currently experimenting using a few of these to detect any hallway movements or as an EVP communication device. A Parabolic Microphone uses a parabolic reflector (or dish) to collect and focus sound waves onto a microphone receiver, in much the same way that a parabolic antenna (e.g. satellite dish) does with radio waves. Typical uses of this microphone, which has unusually focused front sensitivity, can pick up sounds from many meters away, include nature recordings, field audio for sports broadcasting, eavesdropping, law enforcement, and even espionage. The advantage of this device is to amplify the sound wave of where the EVP is being produced from and give one a clearer yet amplified sound. The disadvantage is that to get the perfect location sound wave of where the EVP is coming from, one must point the parabola in its direction. 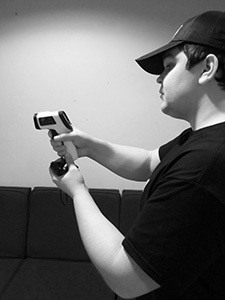 A strobe light is a tool used in ghost investigating which simulates the shutter of a camera. The strobe light allows seeing things that usually would be moving too fast for the mind to perceive. Most believe manifesting apparitions function on a higher vibration than those on the physical plane. The faster the strobe light, the more effectively it works in ghost investigations. Researchers are leading toward the opinion that the strobe exercises the eyes and make them more capable of seeing an apparition. This is particularly true when seeing “shadow people” only seen with peripheral vision seen out of the corner of the eye. 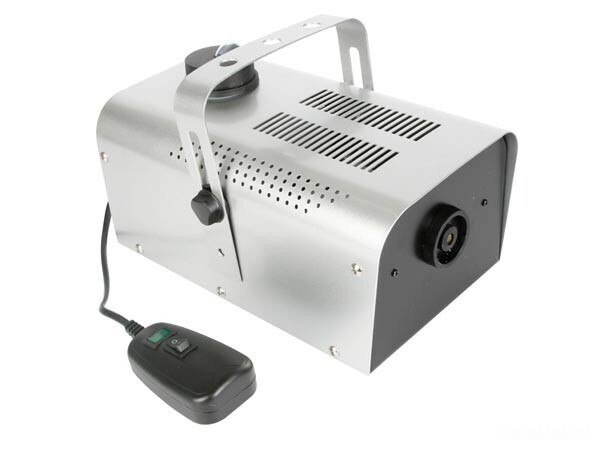 We have both small and larger sized strobe lighting depending on the case location and situation. 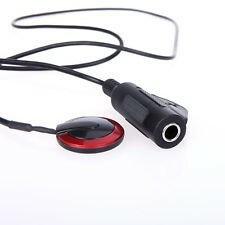 A contact microphone, otherwise known as a pickup or a piezo, is a form of microphone designed to sense audio vibrations through solid objects. Unlike normal air microphones, contact mics are almost insensible to air vibrations but transduce only structure-borne sound. 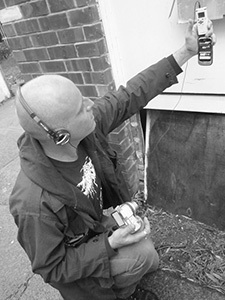 Often used as acoustic leakage probes, they also enjoy wide usage by noise music artists experimenting with sound. Plain contact microphones are passive and high-impedance and this can cause them to sound ‘tinny’ unless used with a matching preamp. If using cameras, either video or for images, tripods are a good idea to have. Tripods can help steady a camera and are needed to mount video cameras in various rooms or areas on a site being investigated. 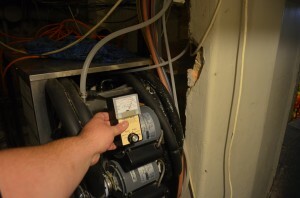 Data loggers are becoming increasingly common as paranormal investigation equipment. A data logger is a device for collecting data over time from several channels simultaneously. If you are trying to monitor a haunted location to look for unusual environmental changes, particularly when they correspond to ghost sightings, data loggers are clearly worth considering. Laser grids are used to more clearly detect when movement happens and help define its shape and whether it actually has some kind of mass to it. 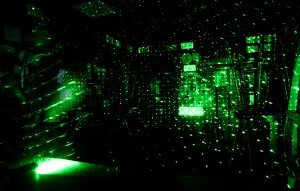 It’s best to place a laser grid in front of a running camera throughout the investigation. Upon review if movement happens it will be obviously apparent by the breaking of the laser pattern. You can from there go frame by frame in the video marking where the pattern shifts thereby drawing an outline shape of the entity itself. If the pattern moves a certain way you can even determine if the entity has 3-dimensional mass and map that as well. Even better results can be had when adding a fog machine to the set-up. Thermometers can be a great way to detect temperature changes which may signify a paranormal presence. Taking temperature readings can also be a great way to find sources for ‘cold spots’ to debunk or find logical reasons for claims of activity. If you intend to take temperature readings at an investigation, consider a digital thermometer. Not only do they keep a memory of the highest and lowest monitored temperatures, most come equipped with alarms and take measurements several times a minute. The alarm feature is especially helpful in letting you know when sudden and drastic changes occur and allows you the convenience to focus your attention elsewhere. A more expensive option for instant temperature measurements are the new infrared laser scanners. A point-and-shoot device that detects temperature differences using infrared technology. 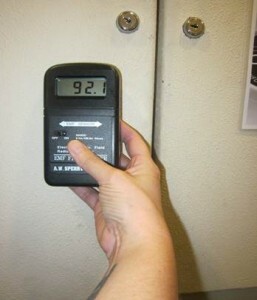 Ambient and Surface temperatures are noted at regular internals at every investigation. Calibrated at 835 MHz (with an accuracy of ±3dB), the RF meter measures the intensity of radiation from cellular as well as GSM mobile phones. Two analog scales: HIGH sensitivity 0-1 mW/cm2, and NORMAL sensitivity 0-10 mW/cm2. Gaussmeter feature is calibrated around 50/60 Hz and offers 2 scales: 0-5 and 0-50 mG plus audio sound which corresponds to field strength. Remote probe with 2 foot extension cord allows user great flexibility and reach. Both RF and gaussmeter provide audio sound and large flashing light which corresponds to field strength. We have been using these Cell sensors within our EVP communication sessions and so far seem to have been having some apparent success. This meter offers magnetic, electric, and radio/microwave detection in one package. Includes an analog readout and an adjustable audio alert. This meter, however, focuses mainly on ‘AC’ or man-made electrical and magnetic fields. This meter is more so effective in detecting man-made currents to debunk claims of ‘being watched’ which can be caused by faulty wiring and/or electrical leakage. 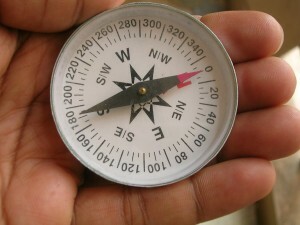 A compass is not only very useful for navigation it is also great for picking up electromagnetic forces. A compass will react to any magnetic or electrical stimulus that may be out of the ordinary. For this reason it is probably better to avoid an electronic compass instead use the needle points north kind. It’s easy to measure the deflection of the needle from magnetic North at known distances with this nice 1-3/8 inch diameter compass to quantify and compare DC magnetic fields, track down magnetized components, or evaluate magnetic shielding performance. A handy tool for any initial evaluation or to check your equipment readings! These devices allow investigators to strategically place cameras around an investigation to provide a continuous feed of live video, while simultaneously recording for later review. Many times these devices are placed in areas with reported activity in an effort to either document the activity, or to provide clients with an explanation as to the cause of their reported events. DVR systems see infrared light allowing them to be of use on night investigations. These devices are pretty much the same as a handheld device except that a DVR system uses static cameras, and are not portable. We use two different systems, depending on the size or complexity of the required set-up. A 4 channel DVR system with infrared technology and a 4 camera portable wireless set-up. Camera’s are placed throughout the investigative site with the hopes of capturing any paranormal activity in reported known areas. This is the smallest gaussmeter available. With the push of a button, this simple and accurate gaussmeter measures the level of magnetic field emitted by all common electrical appliances and equipment. An easy to read 10 LED light bar scale gives readings from 1.3 to 30 mG in small increments. The ElectroSensor has a detection range of 50-60 Hz with an accuracy of ±3dB. A pickup coil in the tip of the unit can be rotated for increased directionality. EMF risk can be avoided if you know where it is. Two Way Radios are recommended if the investigation involves splitting in to teams. This way you can easily communicate with the other team. Check that all radios are communicating on the same channel. We don’t use this as much as we would like to as the majority of the locations we investigate have smoke alarms which are easily set off by these machines. However, in the past we have found them very useful in detecting any potential movement or air displacement in a room, when accompanied by a static laser grid or two. A fog machine can fill the room with thick mist in seconds. Also used to good effect are a stage flood lamp or par cans. The theory is that an entity in the room might just be able to break the beams of a laser grid during movement or cause a ‘shape’ in the lit-up mist as it moves around that, hopefully, can be documented on video as evidence. This set up is best done in a lock-down situation. No team members in the room, all doors , windows and any drafts accounted for, creating a semi controlled situation. A DVR multicamera monitoring system alongside motion-triggered cams will hopefully capture any movement that might occur. These field pumps produce a small magnetic field which is theorised can help spirits manifest, giving them extra strength to be able to communicate. We make and use our own magnetic pumps. 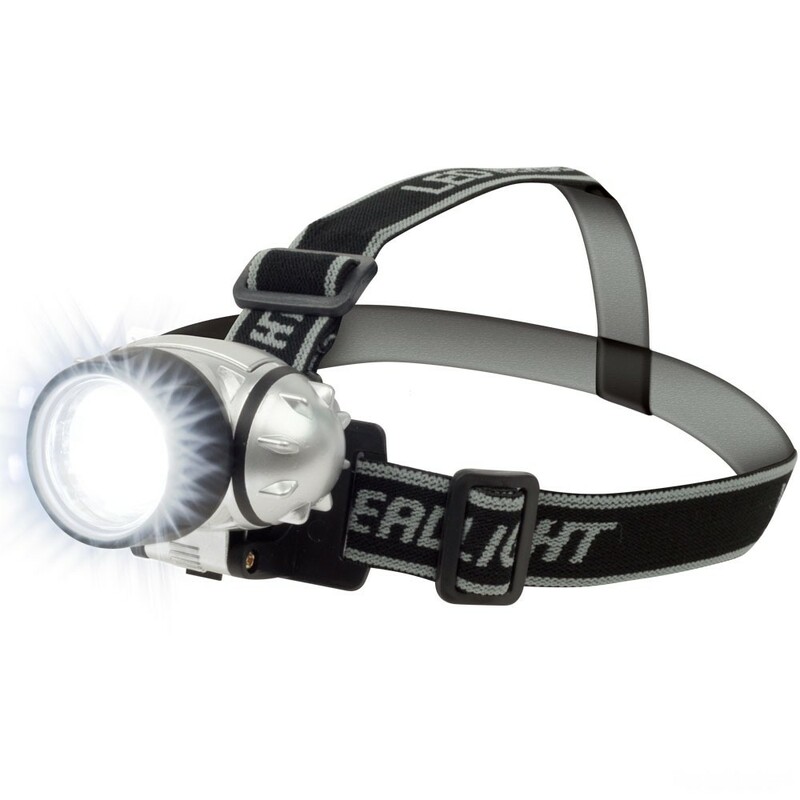 These accessories are used as a way to see in the dark. Illuminators will usually be attached to the recording device by an arm or bracket and will provide a light source for the device’s eye. Usually an infrared light. A must when moving about in the dark during an investigation! High intensity LED bulbs with low power consumption. Unique construction provides light that is super-bright to allow distant objects to be seen, while at the same time, maintains good lighting for close range work, or to move around in caves, camping, etc. Glow sticks are cheap, glow for several hours, and can be taped to objects to mark potential hazards. We use these for adding a little low ambient lighting when filming video with non infrared cameras. A device supposedly used for contacting spirits through the use of radio frequency. These devices or so-called Spirit box also known as Ghost Box or Frank’s box are used as an electronic medium for the purpose of direct communication with a spirit. The notion of using white noise to allow spirits to speak is nothing new. It’s, in fact, one of the original “tenants” of EVP that dates back to the experiments conducted by Dr. Konstantins Raudive in the 1940’s, till his death in 1974. The belief seems to be, that since spirits manipulate energy in order to manifest and/or move objects, they need some form of energy in order to manifest sound. The original set up of “Franks box” was supposed to do a random sweep of the signals which would (seemingly) eliminate the possibility of picking up on any solid piece of signal for too long. Granted this still doesn’t eliminate the possibility you could get frequency pollution from a CB radio or other broadcasting device. Meaning nothing you get is ever “unexplainable” because you can’t eliminate those sources of potential explanation, but in the interest of open-mindedness we decided to create our own, thanks to Barbara’s very handy hubby, (Instead of forking out ridiculous amount on a simple hacked transistor radio) and put it to the test. Not everything in the investigator’s kit is high-tech or requires batteries. 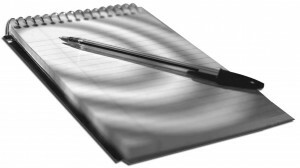 A simple pen and paper can be the most important piece of paranormal investigation equipment you carry! More specifically, you should have a small pad of paper or notebook and at least two reliable pens. You’ll need these to keep a log of what you’re doing, where and when. Your digital voice recorder can help noting the same information, but what if the batteries run out or there’s some other kind of malfunction? Keep notes about the readings of your other equipment, your experiences, and even your feelings.